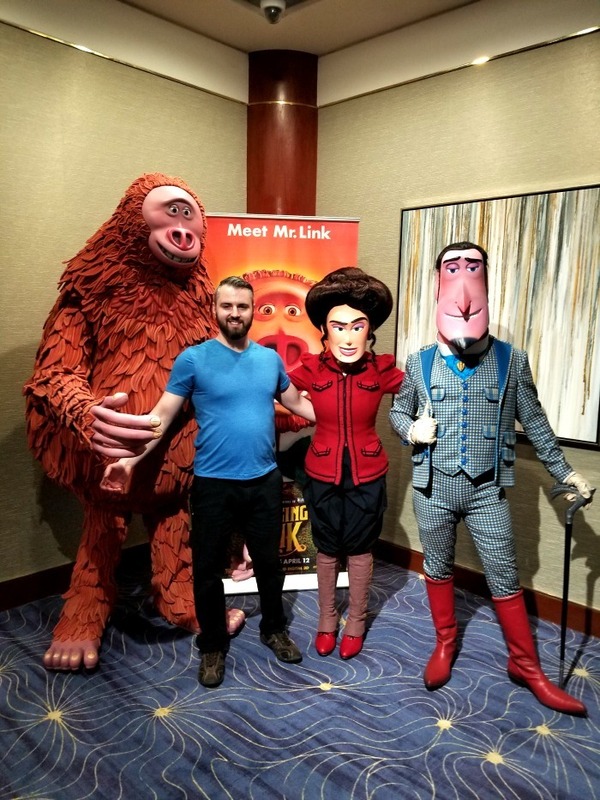 Last weekend, I was invited to Beverly Hills, California by United Artists Releasing for a once in a lifetime chance to interview some of the stars from Missing Link Movie. 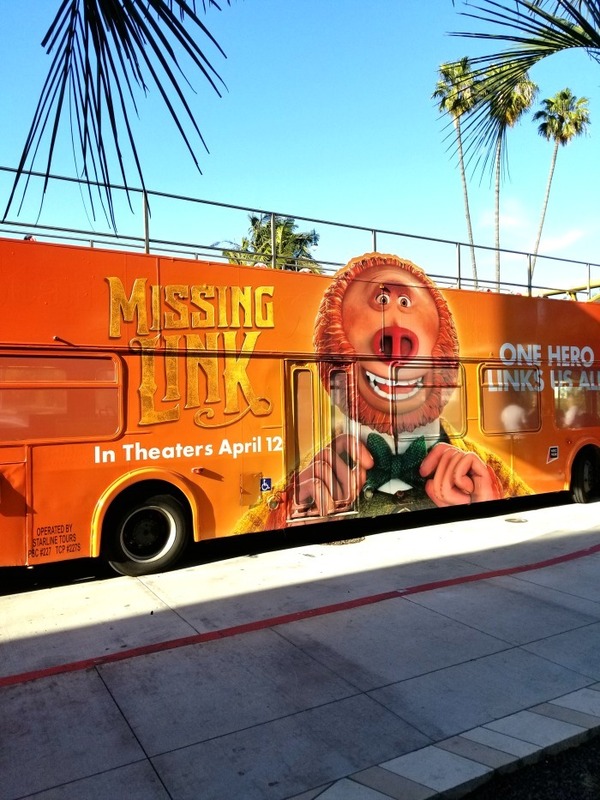 This post is in partnership with United Artists Releasing who provided me with a trip to Beverly Hills for the Missing Link press interview event. This was my first time to California, so visiting Beverly Hills was a memorable first trip that will be hard to beat! The warm sunshine, palm trees, and exotic cars were awe inspiring. I had a beautiful view of the beautiful hills from my hotel room at the Beverly Hilton, which also happens to be where the Golden Globes was held this year! I took some time to explore the city by walking along Santa Monica Blvd and Rodeo Drive. It was really cool to see the upscale designer stores and high-end vehicles driving around like they were a dime-a-dozen! Consequently, this glimpse into how the “other-half” lives, set the stage to enjoy a good movie. I was at Beverly Hills to view a pre-screening of the new upcoming animated film Missing Link! We rode the bus in the above picture to the Real D Theater. I sat up top and enjoyed the wind flowing through my hair. It isn’t everyday you get to ride on a double decker bus, so I made sure to take full advantage! Missing Link is a stop motion animated movie directed and written by Chris Butler. It’s an action packed family comedy from LAIKA that stars the voices of Hugh Jackman, Zach Galifianakis, and Zoe Saldana to name a few. Mr. Link (voiced by Zach Galifianakis) is 8 feet tall, 630 lbs, and covered in fur. He’s actually what some might call “Sasquatch” or “Big Foot”! He’s not what you’d expect from that description though. Sir Lionel Frost (voiced by Hugh Jackman) is a fearless explorer and hunter of legendary beasts. After receiving an anonymous letter pointing him to Sasquatch, he set out to prove his existence. What he found was Mr. Link, which to Sir Lionel Frost’s surprise could speak, read, and write (It was actually Mr. Link who sent the letter)! They embark on a long journey to the valley of Shangri-La in search of Mr. Link’s long lost relatives – the Yeti! The three explorers continue on a comedic and action packed journey to Shangri-La where things don’t exactly go as expected. But along the way, the three grow closer and discover what truly matters in life. 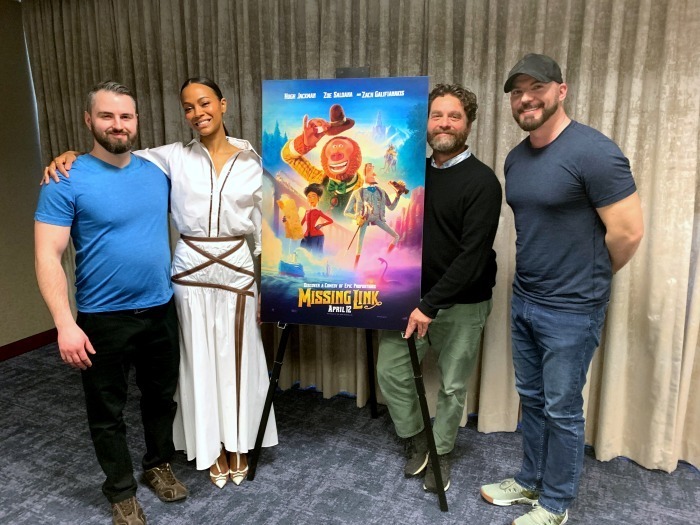 The day after the screening, I participated in a press conference with writer/director Chris Butler, Actress Zoe Saldana, and Actor Comedian Zach Galifianakis. It was a surreal experience sitting in the same room as these talented people and meeting them. The interview lasted 20 minutes and was enlightening to hear their thoughts about the movie. Below are some parts of the interview that resonated with me the most. During the interview process we learned how the Missing Link movie was conceived and animated. In addition, we discovered what drew Zoe Saldana and Zach Galifianakis to their characters. 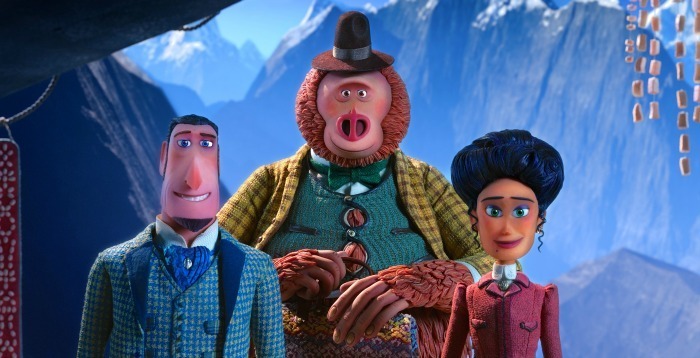 Missing Link is an action packed, uplifting family movie that made me laugh out loud on several occasions! It contains every element necessary to make a movie engaging for me – comedy, action, suspense, adventure, and fellowship. The most awe inspiring aspect of the movie is the fact that it’s stop motion animated. That means every movement of the characters we see on the film consists of multiple mini-movements that come together to produce a 1hr 35min movie! That’s me in the picture above with the lead animator. 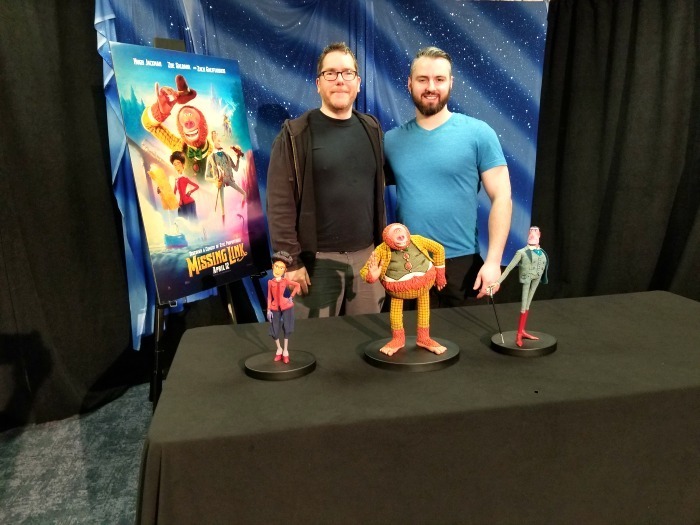 The puppets on the table are the actual puppets used in the movie. They can be moved into any pose as needed. Their facial expressions can also be fine-tuned to match the emotions of the scene and setting. It’s so amazing to see how all their hard work comes together to make Missing Link. 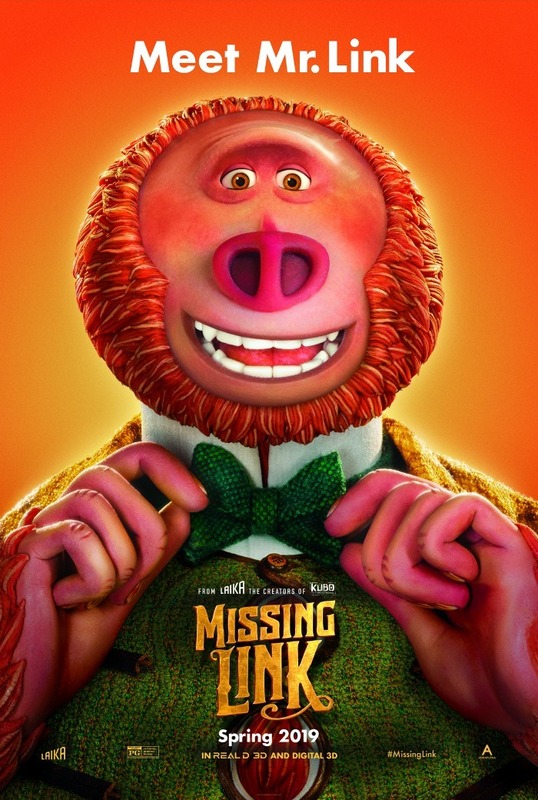 Whether you have kids or not, I believe you’ll love Missing Link. It’s simply a really enjoyable film that will keep you engaged from the very start to the credits. I can’t wait to watch it with my kids! I know they’ll love it! I will enjoy this movie. I’ve been wanting to watch a light hearted film and I am sure the Missing Link will not disappoint. Thanks for sharing your insights and the interview with Zach Galifianakis, the voice behind Link. This is going to be so good! 10 seconds into the TV trailer, I knew I wanted to see it. Thanks for sharing this interview with us. One of the big pluses of this movie for me is the cast. We’re all set to see this movie, and we couldn’t be more excited. My husband, the kids, and I all love the art style, and I’m a huge fan of the entire cast. I love watching beautiful animated films! I will definitely keep an eye out on The Missing Link! Thanks for sharing your fabulous Hollywood adventure! I want to see this one. I love movies where the ‘adult” humor is infused into the kid movie. Glad to read your review, too. I am very excited to see this with my kids. Looks like a fun, light hearted film! I’ve haven’t seen this movie yet, but it’s on my radar now. Thank you! I have heard such wonderful commentaries on this movie!! I can’t wait to see it with my fam! I can see you had a great time. Animation movies are real fun & am eagerly looking forward to the movie being released here in India. So cool you got go to the press junket for Missing Link. I love when Zoe Saldana plays in voiceovers! This looks like a great movie! I love your article, very well written. We will keep an eye open for it’s release! I just saw an advanced screening of this movie in Atlanta this weekend and loved it! I can’t wait to take my kids and see it again.